Body Material: Forged Brass, S.S. 304, S.S. 316. Solenoid valves for all kinds of textile machines . Ranging in size from 3/4 to 1.5 in diameter, the Valcor Scientific family of Instrumentation Valves delivers performance and durability normally encountered only in larger, more expensive fluidic devices. We design and develop a wide range of double solenoid valve which are fabricated using high grade raw material and are offered in customized form and at industry leading prices. 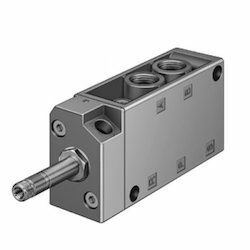 Our range possesses a solenoid pulse to move cylinder one way. The Other solenoid pulse moves the cylinder the other way. Max Changeover Frequency: 300 min. - Common Inlet / Exhaust ports on both sides of manifold plate for ease of interconnection. 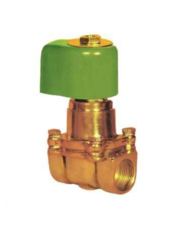 - Standard side ported Exel valves are used in manifold. - Gang manifold suitable for any combination of 3/2, 5/2, 5/3 Pilot and Solenoid valves.